I made half quantities, using 2 small eggs. I have never added wholemeal flour to hot milk before, rest assured that it does indeed instantly turn to mush. I have never bought creamed corn and didn’t have any at home, but according to my understanding, it’s sweetcorn in thin white sauce. So I slaked a little white flour with milk and added this to some ordinary tinned sweetcorn. This needed almost an hour to cook. It didn’t not begin to get browned and puffy until around 45 minutes. It was still rather damp in the middle and after cutting off a wedge to eat with sausages and peas, I put the rest back in the cooling oven to dry off. It was surprisingly light, more like a thick pancake than a scone or yeast bread. A half quantity made a circular bread of 9 inches diameter and 1.5 inches deep – how much this feeds is dependent on what you serve with it (and how hungry your guests). It reheated well in a dry frying pan or warm oven and went well with everything, but especially spicy foods and anything containing onions. 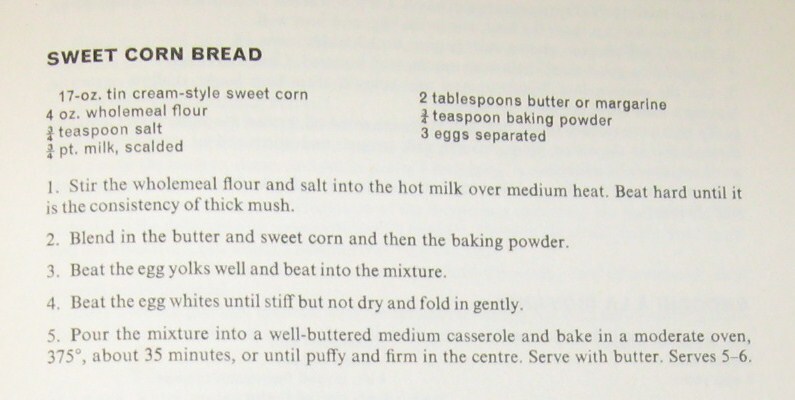 This entry was posted in 1970s, Lousene Rousseau Brunner, New Casserole Treasury and tagged butter, egg, salt, sweetcorn, wholemeal flour. Bookmark the permalink. Why don’t YOU move to South America? They hide sweetcorn in everything. 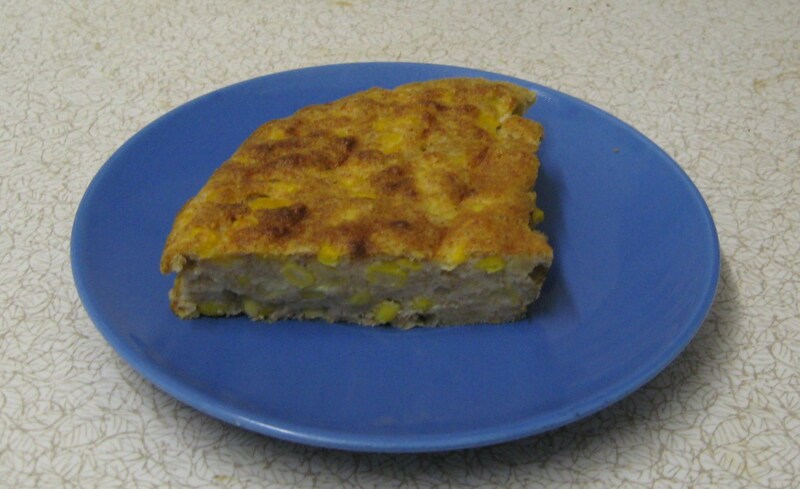 Wow, are we going to have to have a cornbread-off? We could, but I would lose and I would not enjoy that.